From early discussions about the operation the surgeons said your rehab will be at Headley Court. I had mixed thoughts about this, after my injury and discharge from Selly Oaks in Birmingham I came to Headley and it was hard work but I was still a serving soldier then so my rank still counted and I had to toe the line i.e. Shaving, hair cut short, wear green t shirts, be in the right place at the right time but this time we are Entitled Civilians ..! It’s a bit strange because there are still Army staff and patients here then me and the two other lads who had the operation at the same time. We are playing the game by respecting the rank of the staff but we are not doing stuff like registration at 08:15 we are just going to our first session. Day one was amazing! After not the best nights sleep in a shared room.! I went straight to prosthetics with physio in the morning and it was great to see some old faces of the staff from last time I was here. We had a quick brief about what was expected of us and what we might achieve and then unexpectedly it was on with the genium ( the lower prosthetic) and over to the bars. 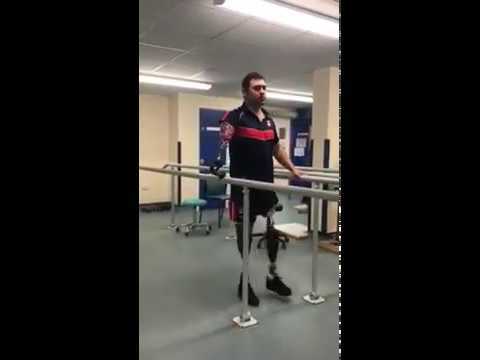 Standing up for the first time felt absolutely amazing ..! No socket cutting into the groin. No liner pinching the skin. No plastic rubbing against the side of the thigh. No sucking sensation at the end of the stump. Just a feeling of freedom and standing with my legs together without pain. I stood for about 5 minutes and then asked Kate my physio if I could take a few steps forward ? I was expecting her to say One day at a time Andy but to my surprise she said yes but hold the bars and take small steps ..! Wow I can’t explain the feeling of walking forward without a socket it was like having my own legs before that day in 2009 ..! Total freedom without aches and pain ! Well not totally without pain, I was using muscles that have not worked for nearly 8 years so was in some pain but some ice and stretching helped and some rest.